Twitter has already eight years and it keeps changing, introducing new features, trying to be always at the top of the social networks available. If you are a blogger or internet marketer, without any doubt you already have an account on Twitter, but the questions is : are you using this social to its full potential? There are a number of free tools online that you can use in order to expand your audience, increasing your exposure and building new connections. Twitter is just great to promote your content, product or service. Although it is true that is better to prefer quality over quantity, a large number of followers definitely helps to have a good influence. Here you find a list of awesome free tools you can use to trigger the great potential of Twitter. With Twiends you can gain exposure for your Twitter account and receive new followers. You can also this service to search for new accounts to follow. Twiends is free and like JustRetweet, allows you to perform some action in order to receive free credits to spend on the site. When you follow other Twitter accounts, you gain some “seeds”. You can then spend your “seeds” to get new followers, increasing your audience and exposure. You can use ViralContentBuzz not only to boost your Twitter exposure, but also to increase your Pinterest and Facebook audience. When you sign up for your account, you should browse within the category list on the left of the page, in order to find the topics you are interested in. After this, you can choose to gain free credits promoting other user accounts. With the credits gained, you can create new projects, that will be shared by members. 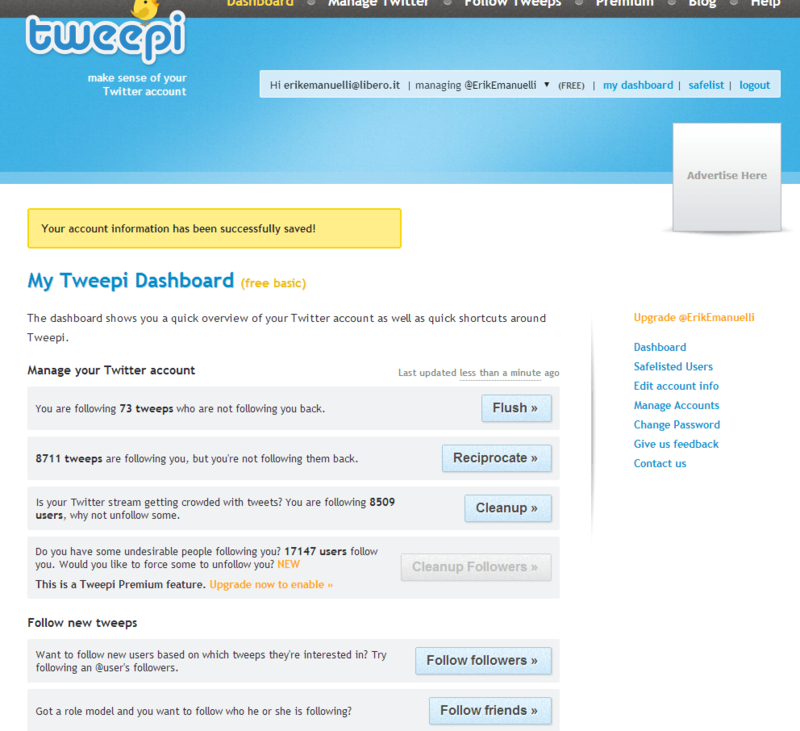 One of the most complete free tools available online for Twitter is Tweepi. You can use it for “flushing” people who are not following you back, or reciprocate following users who are actually your followers. You may want also to cleanup some inactive people and finally find new users to follow. You can use Tweepi to follow up to forty accounts at once. Remember that this site applies Twitter rules to allow you to follow a certain number of people at a time. Be sure to not be too aggressive in creating your Twitter tribe and make one step at a time. You can follow for example like 20-40 users and see how many will decide to follow you. After some days, you can cleanup people who are not following you back. 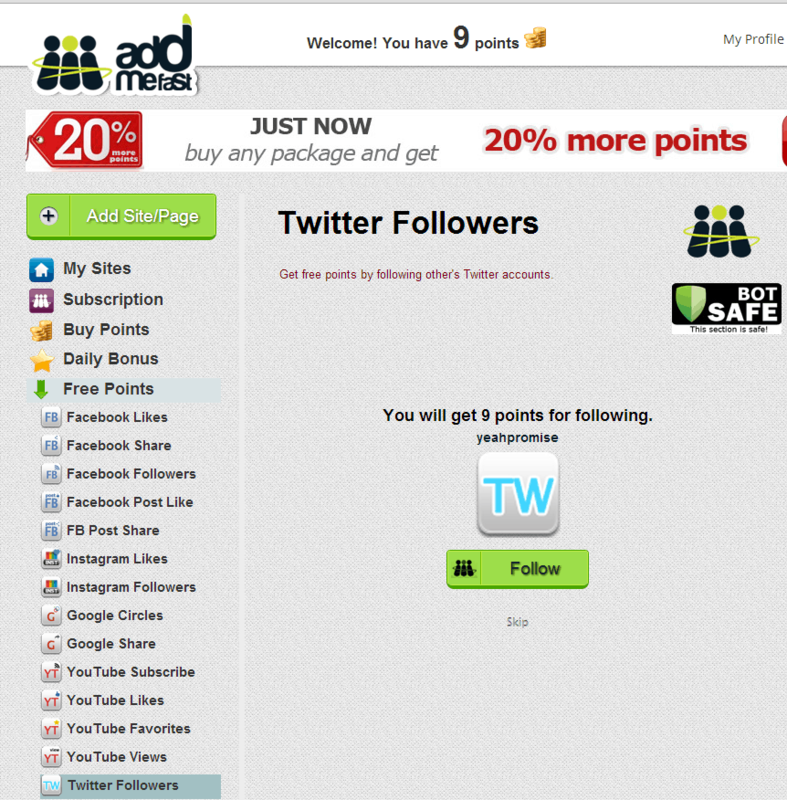 AddMeFast allows you to gain free points by performing some actions with your social media accounts, included by following some Twitter accounts. With the same principle of the other tools listed in this post, you can use the credits earned to list your Twitter account in their system, receiving some new followers. Pay attention of which actions you perform, the frequency and the social media account you decide to connect. AddMeFast.com can be a powerful tool, but be sure to use it wisely. Even if using the tools listed above can help you increase your followers on Twitter in a fast and easy way, by using the tips below you can increase your Twitter audience in a natural way. 1. Complete your Profile : if you still have an egg as profile picture, no one will want to follow you. Be sure to add a great description and a nice picture, with a big smile. 2. 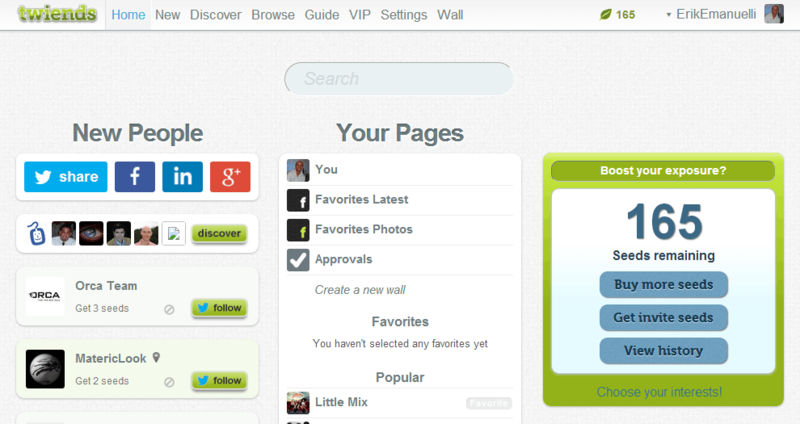 Follow influential users : identify your niche and find the most popular users to follow. 3. Tweet other users content : in this way people will notice your name and eventually will decide to follow you. 4. Mention Twitter accounts : when you are retweeting other posts or sharing some people content, be sure to include their @username. 5. Don’t be afraid to ask : you will be surprised of how many followers or retweets you can receive by simply asking for that. 6. Set up Twitter buttons on your site : in this way your readers can easily promote your content. Be sure to automatically include your Twitter username. 7. Use Triberr : it is a MUST use platform in order to boost your social media presence and influence. How to Use #Triberr – Best #Social Network for #Bloggers? You probably already have a Twitter account, but be sure to invest some of your time in developing your presence and authority in this popular social media network. These are some awesome tools Erik. Thanks for sharing. I’ve heard and seen most but never actually played with them, must try them! Thanks for the feedback, Shameer. That was a post that introduced some very useful tools. Many of the tools you described there are new to me. I’m sure that making use of them consistently and religiously will sure help me boost my Twitter exposure and influence. I’d also like to add a tool to that collection- JustRetweet. It sure helps get some more Retweets and exposure. I’ve been making use of that tool too. Found this post on Kingged.com, where I’ll Kingg it! I’ve been writing so many times about JustRetweet, that I skipped it in this article. But thanks for mentioning in your comment. Well, sure nice tools but what’s the point of getting Twitter followers that will never retweet, reply on tweet or click a link? It is a bit pointless to get followed by 2000 fake accounts, don’t you think so? I do agree with you, in fact I mentioned the importance of getting followers, the natural way. It’s better 1000 real and engaged users, than 10000 useless followers. Yes, while these free tools could be handy to increase Twitter exposure for marketers. I have used a couple of these and others. The seven tips to increase natural followers described in this post are spot on. Twitter has its rules and it is important to follow or apply these rules. This comment was shared in kingged.com – the social bookmarking website for Internet marketers where this post was found. indeed, it’s better to increase followers the natural way. First of all I want to say thanks for this nice article, these tips are awesome, specially triberr is one of the best platform for bloggers. Twitter is really very powerful platform and there are lots of tools available, i am using only justretweet and its work good for me. I love Triberr : you can really expand your social media audience there with a little effort! These looks like some great tools. I can’t blame anyone for using tools these days to help them promote their account and services… social media these days is just like a full time job if you want it to go anywhere. I currently use Tweet Adder 4. It’s one of my favorite twitter bots. I am against Twitter bots. so I’ve never considered the idea. But thanks for sharing your feedback. Yet another useful list article here by you. I am using Tweetlow and Twiends. These two sites are helping me a lot to get good results from twitter. I’ll try other tools listed by you too. Thanks for these useful tools and valuable tips. I’m glad that these awesome tools are free. These would be really beneficial for anyone who wants an exposure on Twitter. Also, the tips you’ve provided are useful and are indeed simple to increase Twitter followers naturally. What I like the most of these tips is number 5, “Don’t be afraid to ask”. I’m seeing myself learning a lot of things as I gain Twitter audiences. That’s great. Glad to see you enjoyed the post, Ann. Of course great post for getting followers for twitter. I think I’ve tried twiends and addmefast which is really popular and best platforms for genuine followers. Great to know that, Samir. These are great tools to help increase one’s twitter follower and probably generate traffic. I have used some of them and will make use of some you have shared. Thanks for reading and commenting, Ayodele. Great to know you learned something from this post, Vino. Good post regarding Twitter tools. There are so many on the Internet at this moment. I think it is a waste of time to try all them or even use more than 3-4. If we focus on using 3-4 tools for Twitter, we are losing more time than saving some. For now, I’m stick with Buffer and manually publishing and interacting with my audience. Nice twitter tools and using tools will surely get lot of engagement in our followers. I guess all the quite popular too. Thanks for your comment, Vicky. I have heard about Tweepi, the rest are really amazing and i can’t wait to try it. thanks for your valuable information Erik, looking forward to your new sharing. Great you learned something new from this article, Stephan. Thanks for your feedback here! Wow..! Perfect twitter tools sir. I have not noticed these till now and I would surely get to know everything now. I hear about twiends and add me fast. Now I would like to use even other. thanks for sharing. I am glad you enjoyed this blog post, Tharun. And the free Twitter tools mentioned. Awesome twitter tools, thanks for listing them here. Now it’s time to start using them and increase followers. Thanks again Erik. Glad you liked the tools mentioned here. Amazing and wonderful tools Erik, I was searching for a post like this one from a couple of days and found it on your blog after a lot of search. Glad you found what you were looking for, Ammar.